Hands-on coaching, professional development, and mentoring are crucial for teachers, especially those who are just starting out in their careers. 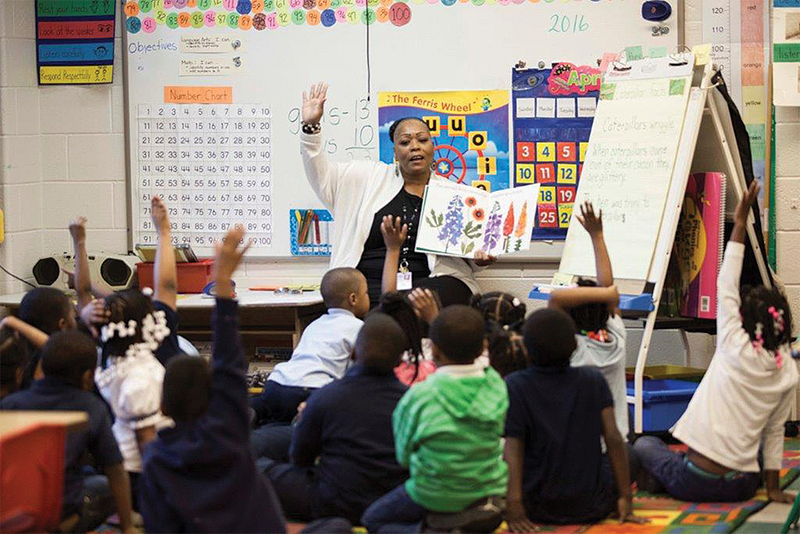 It’s even more important for educators who are tasked with teaching in schools with low-income populations, where they are challenged with closing the reading achievement gap between kids from lower-income households and their wealthier counterparts. Here’s one group partnering with teachers and school leaders to improve children’s early literacy and grade-level reading skills. Children’s Literacy Initiative (CLI) partners with school districts to train and coach preschool through third grade teachers in the most effective techniques for teaching literacy. Teachers participate in workshops, receive high-quality children’s books for their classrooms, and work with a coach to incorporate effective reading strategies into their classrooms. In addition, one teacher per grade is trained as a ‘model’ teacher to serve as a coach to peers and an ongoing resource to the school, even after CLI’s three-year program ends. The program also instructs school administrators on how best to deploy teachers and facilitate professional collaboration through practices like scheduling common planning time. CLI typically works with a school for three years. During the 2015-16 school year, CLI trained 2,206 teachers in 28 districts nationwide, reaching a total of 41,650 students. As part of a three-year national expansion plan, CLI has also launched a free online resource called LEARN or Literacy Education and Resource Network, which gives all teachers access to best practices and effective training modules. Compared to over a dozen federally-funded programs aimed at improving early literacy, CLI stands out for its demonstrated effectiveness, as validated by a rigorous external study. A recent three-year evaluation found that in four high-poverty, urban districts (Camden, Chicago, Philadelphia, and Newark), children receiving instruction from a CLI-trained teacher develop measurably stronger reading skills than kids taught by teachers with no CLI training. Across all four sites, kindergarten and second grade students in CLI schools scored higher on early reading tests than students in similar schools with no CLI-trained teachers. In addition, district standardized test data obtained by CLI found that for a cohort of 100 program participants, an estimated 6 to 10 additional students were reading at grade level by the end of grade three, a critical milestone for future school success. Based on costs provided by CLI, public information regarding national trends in teacher tenure, and information showing a high degree of teacher satisfaction in schools receiving CLI services, CHIP estimates a ‘bang for buck’ of approximately $1,300 to $1,700 for each incremental student from a high-poverty, urban school that can now read proficiently by the end of third grade. You can donate any amount on CLI’s donate page. For example, a $10 donation will buy books for a classroom; $50 helps create a classroom reading nook; $100 gives a teacher one-on-one instructional coaching; $500 sponsors a teacher’s attendance at a CLI literacy workshop; and $90,000 will cover the annual costs of implementing CLI across one school. You can find CLI programs and their local implementing partners on CLI’s website. You may also want to consider programs working to improve literacy during the summer, such as Springboard Collaborative or BELL, or programs that provide high quality preschool instruction, including Appletree, Educare, Jumpstart and Acelero, among others. Look for literacy programs that have experienced teachers leading instruction, that deliver professional development over an extended period (i.e. not just a day’s training), that use active learning strategies, engage parents and families, and that measure children’s reading gains using a nationally recognized literacy assessment.